A recent study published in BMJ (British Medical Journal) found a link between high consumption of ultra-processed food and higher rates overall of cancer, but also a higher risk of breast cancer. Specifically, a 10% increase in the proportion of ultra-processed foods in the diet was associated with a greater than 10% increase of overall cancer and 11% increase of breast cancer during the 6+ years of the study. Alarmingly (because of the health implications), several surveys (in Europe, the US, Canada, New Zealand, and Brazil) have suggested that ultra-processed food products are now between 25 to 50% of calories eaten every day. 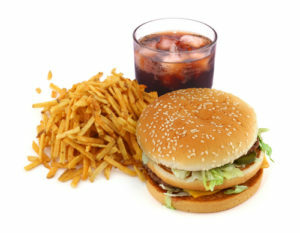 Ultra-processed food is food that is highly processed. It is food that is mass produced and packaged, as well as foods that have manufactured substances in them - such as hydrogenated oils (also contains trans fats), protein isolates, additives, preservatives, artificial or natural flavors, colors, nitrites (in processed meat), titanium dioxide (nanoparticles), etc. The food packaging can leach chemicals such as pthalates (endocrine disruptors). The list goes on and on and on. All of these things in ultra-processed foods may be involved in causing health problems, including cancer. They are typically also poorer nutritionally and higher in salt than unprocessed or minimally processed foods. These ultra-processed foods that are so popular are all around us - in fast food, in mass produced desserts and breads, packaged snacks, soups, cold cuts, margarine, frozen or shelf stable ready to eat meals, instant foods, sodas and drinks, etc. On the other hand, unprocessed or minimally processed foods are fresh, dried, ground, chilled, frozen, pasteurised, or fermented foods such as fruits, vegetables, legumes (beans), rice, pasta, eggs, meat, fish, or milk. There are also “processed culinary ingredients” which are salt, vegetable oils, butter, sugar, and other substances extracted from foods and used in kitchens to transform unprocessed or minimally processed foods into "culinary preparations" (meals). The study did NOT find any association with unprocessed, minimally processed, or processed culinary ingredients with cancer. Only with the ultra-processed food. Instead, the study found that higher consumption of “minimally/unprocessed foods” (and lower ultra-processed food) was associated with lower risks of overall cancer and breast cancer. Objective To assess the prospective associations between consumption of ultra-processed food and risk of cancer. Design Population based cohort study. Setting and participants 104 980 participants aged at least 18 years (median age 42.8 years) from the French NutriNet-Santé cohort (2009-17). Dietary intakes were collected using repeated 24 hour dietary records, designed to register participants’ usual consumption for 3300 different food items. These were categorised according to their degree of processing by the NOVA classification. Main outcome measures Associations between ultra-processed food intake and risk of overall, breast, prostate, and colorectal cancer assessed by multivariable Cox proportional hazard models adjusted for known risk factors. Results Ultra-processed food intake was associated with higher overall cancer risk (n=2228 cases) and breast cancer risk (n=739 cases). These results remained statistically significant after adjustment for several markers of the nutritional quality of the diet (lipid, sodium, and carbohydrate intakes and/or a Western pattern derived by principal component analysis). Conclusions In this large prospective study, a 10% increase in the proportion of ultra-processed foods in the diet was associated with a significant increase of greater than 10% in risks of overall and breast cancer. Further studies are needed to better understand the relative effect of the various dimensions of processing (nutritional composition, food additives, contact materials, and neoformed contaminants) in these associations. In this large prospective cohort, a 10% increase in the proportion of ultra-processed foods in the diet was associated with significant increases of 12% in the risk of overall cancer and 11% in the risk of breast cancer. A few studies have previously suggested that ultra-processed foods contribute to increasing the risk of cardiometabolic disorders—such as obesity, hypertension, and dyslipidaemia —but no previous prospective epidemiological study has evaluated the association between food processing and risk cancer. What is already known on this topic: - Ultra-processed foods are often characterised by lower nutritional quality and the presence of additives, substances from packaging in contact with food, and compounds formed during production, processing, and storage. - A few studies have observed ultra-processed food intake to be associated with a higher incidence of dyslipidaemia in Brazilian children and higher risks of overweight, obesity, and hypertension in Spanish university students. - Although epidemiological data relating to cancer risk are lacking, mechanistic studies suggest potential carcinogenic effects of several components commonly found in ultra-processed foods. What this study adds: - This study assessed the associations between ultra-processed food consumption and risk of cancer in a large prospective cohort. - A 10% increase in the proportion of ultra-processed foods in the diet was associated with a significant increase of more than 10% in the risks of overall and breast cancer. - If confirmed in other populations and settings, these results suggest that the rapidly increasing consumption of ultra-processed foods may drive an increasing burden of cancer in the next decades. Next article:Ultra-Processed Foods and Alzheimer’s?